Introducing boiled eggs to babies is a slow and gradual process. Although your baby might begin experimenting with other solids before his 6-month birthday, eggs are considered a potential allergen and you should wait a little longer to introduce them into your baby's diet. 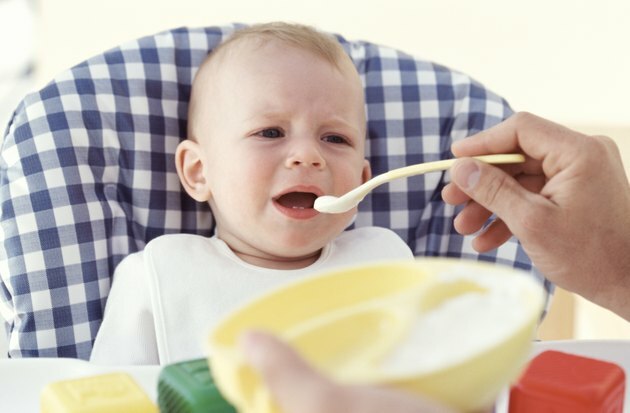 Never force your baby to eat solids if he is not ready, and report any possible symptoms of allergic reaction, such as hives, vomiting or swelling, to your pediatrician immediately. Wait until your baby is 4 to 6 months old, shows interest in eating solids, has completely lost her tongue reflex and can sit upright while supported before introducing any solid foods. Allow your baby to become used to eating and swallowing solids by offering him rice cereal and pureed fruits and vegetables, such as applesauce, mashed carrots and creamy banana, before moving on to boiled eggs. Boil an egg until it is thoroughly cooked, or for about 12 minutes, when your baby is about 9 months. Cool the egg before scooping out the yolk. Discard the egg white. Mash the yolk with a spoon and mix it with a tiny bit of breast milk or formula if it is too dry for your baby to swallow. Wait several days after giving your baby egg yolk before introducing new foods to determine whether you baby reacts poorly to the egg. If not, you can add the yolk to your baby's diet. Give your baby an unmashed yolk as a finger food along with soft fruit chunks and pieces of cooked pasta. Offer your baby whole, hard-boiled eggs once you determine he does not have a negative physical reaction to egg yolk. If your baby shows no allergic symptoms to the whole egg, begin serving scrambled and other well-cooked egg dishes. Wait until after your baby's first birthday to introduce egg whites, the most common source of food allergies in babies, if your baby suffers from other food allergies or has a family history of egg allergies. Your pediatrician may recommend waiting until your child's second birthday before introducing egg whites.